We pick up at most Las Vegas hotels before departing on this daily Hoover Dam City Deluxe tour of the Hoover Dam. Experience this engineering man-made wonder of the world. One of the biggest and most successful government projects of its time, the Hoover Dam actually was completed on time and under budget. Your professional driver/guide will provide expert narration on this roundtrip tour from Las Vegas while you enjoy a ride onboard a luxury motorcoach with airline-style reclining seats, footrests, onboard restroom, air conditioning, and large vista view windows so you won't miss a thing. After exiting the Theater, join the queue on this same level to enter the Hoover Dam Powerplant. From here, a 70-second elevator ride takes you 530 feet down through the rock wall of Black Canyon to begin a 30-minute guided tour. You'll exit the elevator into a tunnel drilled in the 1930s for construction, and take a short walk to the Penstock Viewing Platform. Penstock Viewing: This location is atop one (of four) of the huge 30-foot-diameter pipes that can transport nearly 90,000 gallons of water each second from Lake Mead to the dam's hydroelectric generators. An animated display helps describe the complexities of the construction of the dam, and how it presently operates. 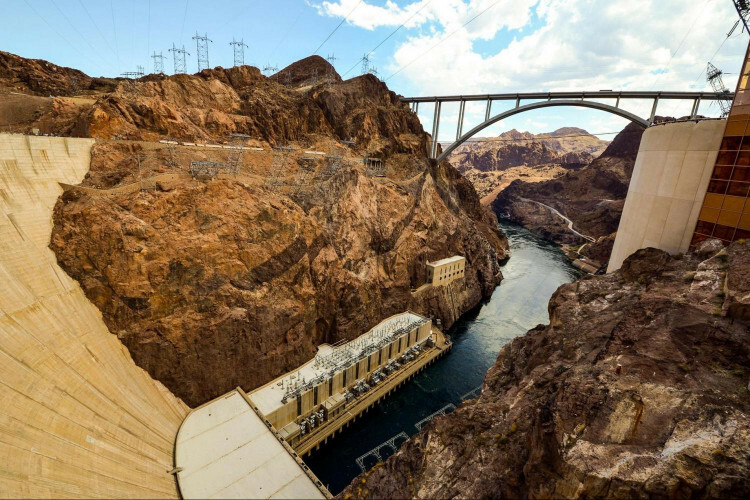 Upon exiting the interior portion of the tour, you will have some time to explore on your own to see the Hoover Dam and all of its majesty. This tour includes a stop at the newly redesigned Hoover Dam Lodge, for a delicious meal and some time to explore the surrounding area. After lunch we will make a stop at the Ethel M's chocolate factoryfor a self-guided tour and a free sample of chocolate made right here in Las Vegas!